I know there was another thread where someone was replacing their head unit on a GT model with Bose but I replaced mine a week ago and figured I’d share. Installed with the PAC unit from Crutchfield. I didn’t take any pictures during the install because I was in a hurry to finish it before leaving for vacation. It’s a pretty straight forward install, though. The PAC harness plugs right into the car harness and then the headunit. I had a problem with my first PAC box where the unit wouldn’t power on and spent a while on the phone with Crutchfield before they finally sent me a new one. The new one worked right away but the backup camera did not. I had to bypass the power limiter, or whatever it’s called, that drops the voltage for the backup camera because the car was already dropping the voltage as needed when shifted into reverse. Once I did that the backup camera works perfectly. In short, I love this thing. The bigger screen and simple interface are exactly what I was looking for and make the car feel more user friendly. The Bluetooth connects soooooooo much quicker than the stock unit and the capacitive screen looks awesome. The reflections can be a little hard on the eyes in certain lighting angle, even with my 5% tint, but I didn’t find it to be too much of an issue on my 7 hour road trip. Apple Car Play works way better than I even expected and I find myself using that more than anything else. It’s very intuitive although I do hate how limited it is. Apple maps is pretty good, all things considered, but once 3rd party maps are allowed in IOS 12, it will be a game changer. The stock rear view camera on the bigger screen is just a stretched image but I find it way more useful. The cross traffic alerts still work but you obviously don’t get the *Warning* across the bottom of the screen. And the sound is pretty awesome. I didn’t upgrade any speakers with the head unit, and both front door subs are previously blown and have been rigged to work properly, but this unit still manages to make them sound so much better. 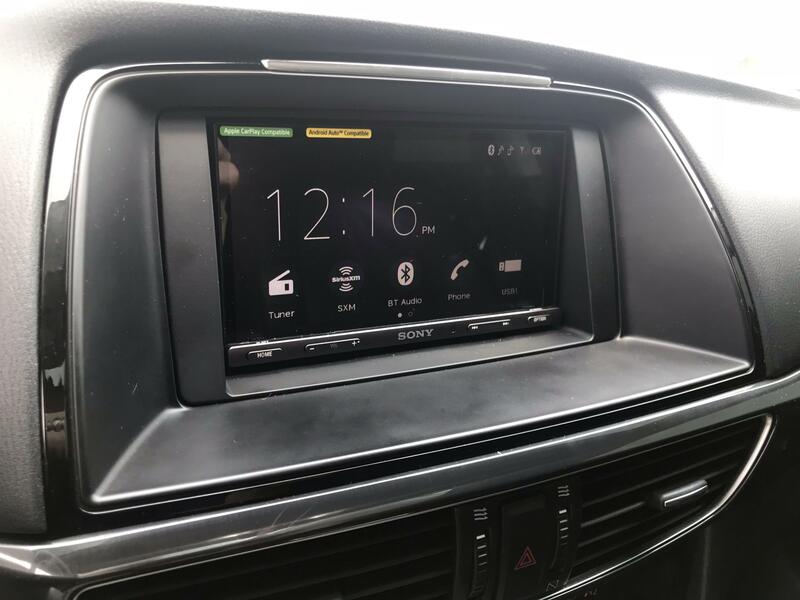 I think any aftermarket head unit will have a significant impact on the sound of the Bose system- which many people have suggested. I really don’t have much bad to say other than Android Auto doesn’t work consistently. The primary reason I wanted this unit was to have Waze when driving because I interstate travel a lot for work and I hate having to have my phone in my lap to run Waze. When it works, I absolutely love it. But I’ll get 10-15 minutes, if I’m lucky, and then it starts timing out and resetting. I have a personal iPhone so I usually run apple maps on the screen with Waze running in the background so I can still get the Waze alerts but Waze maps and guidance are so much better, too. But I have a Galaxy S7 for work that I have been trying to use with the above results. I’m on my 3rd different cable with the same results. Some googling has shown it’s a relatively common experience amongst Android users so I may be stuck waiting for the full IOS12 rollout and hope Waze supports Car Play early. The other bad thing is that the Commander knob, and accompanying buttons, are not supported. At all. It becomes completely useless. I thought this would bother me more, and is part of the reason I’ve held off on changing the head unit, but I honestly don’t even notice most of the time. I programmed my steering wheel buttons to allow for track pausing and volume attenuation so everything is still at my finger tips without many reasons to touch the head unit other than to change apps in Car Play and Android Auto. I know there’s a lot more I’m leaving out but if you have any questions feel free to ask and I’ll answer as best I can. Here’s a quick picture of the unit installed, I can get better pictures or comparison to the stock unit if anyone wants, too. Looks awesome! I've been holding off because of commander stick, but I guess you get over it fast. You really do. I held off for years because I didn’t want to lose it but you adjust quickly- especially using Car Play or AA. I still wish it worked because that would make it truly factory-like but after a couple days I really didn’t notice or mind. Are they usable with the Pioneer unit? Or is there an AUX and USB input on the Pioneer? I have a 2014 Sport and I hate, detest, excoriate, revile, and despise the USB/Bluetooth module in the factory head unit. I have tried multiple dealerships without success to get the USB module updated with the better one. I have given up. I and my wife both have iPod Classics (I know, we’re old) and I would like to be able to plug them into the USB port on the head unit rather than kicking it old-school with the AUX input. Does the Pioneer offer either of these? I am not entirely sure I know what you're asking...or if you're in the right thread since this is for a Sony unit. There are 2 USB inputs on this Sony unit. 1 has enough amps to charge your phone and run Car Play or AA and the other is meant for a USB stick or I would suppose even an iPod would work on it. But either way, the USB 1 connection would work fine for your iPod. The cable is permanently attached to the unit and is long enough to be ran to the dash and then you plug whichever cable you need for your device to it. As opposed to have to run a cable to the back of the unit that you are then stuck with. Last edited by Poet; 07-30-2018 at 01:35 PM. What I meant was, is there any way to connect the USB and AUX jacks that are under the console arm rest to the Sony unit? Crutchfield’s website says the factory USB and AUX will not work with any aftermarket head units. Ahh that makes more sense lol. Crutchfield used to offer a harness that would connect to the factory USB harness so that you could retain it but they very recently stopped offering it and I'd be lying if I said I knew why. So aside from tracking one of those down, I don't think there is a way to do so. But on this particular unit there are 2 4ft long USB cables that come from the back of the unit that you could add an extension to and run it to where is convenient for you. There is no AUX input but there are plenty of units out there that do offer them. Your Sony unit looks great in the photo. I’ll call Crutchfield and see what they tell me about the connections. The adapter that used to be sold does NOT work on the SkyActiv cars; it doesn't plug in. Guess how I know this? Lol, well there you go. The reason why they don't offer it anymore. 8 Attachment(s) Let's talk tail lights! !